It is normal for you to feel anger and frustration after the death of a loved one. But when there are unresolved questions about your loved one’s death, or worse, direct evidence that the death was caused by someone else’s negligence, these feelings multiply. Coping with the wrongful death of a loved one is never easy, and your family is most likely shouldering unexpected financial burdens associated with medical expenses, funeral costs, and lost income. It is important to have an experienced San Marcos wrongful death lawyer on your side to help you through this difficult time. The Rubinstein Law Group has been fighting for the rights of wrongful death victims in the Oceanside, San Marcos, and Escondido areas for 25 years. Mr. Rubinstein understands the devastation caused by these tragic events, and he is committed to helping you find the answers to the many questions you must have right now. While no amount of money can truly compensate you for your loss, a wrongful death settlement can help your family stay financially afloat as you try to move on with your lives. Please contact the Rubinstein Law Group at 866-771-7181 today to schedule your free consultation with our Carlsbad wrongful death lawyer at our San Marcos office. When someone dies due to the negligent actions of another, it is considered wrongful death and the family of the deceased may be entitled to recover compensation for any damages they have suffered. In most instances, only the surviving spouse and children of the deceased may file a wrongful death claim, but in some cases the victim’s parents may be entitled to file a claim as well. 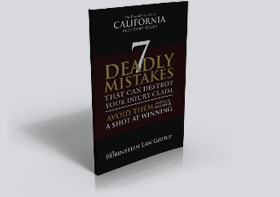 Calculating damages in a wrongful death claim is more complex than in most other personal injury cases. Our wrongful death lawyers in Oceanside will work with a team of financial analysts and economists in order to accurately assess the financial impact the loss of your loved one has had on your family. Our personal injury lawyer in San Marcos will consider all of these factors in order to ensure your compensation reflects the true extent of your loss. Zev Rubinstein has built his reputation by providing his clients with the high quality legal representation they deserve. When you work with Mr. Rubinstein, you will receive unparalleled levels of personalized care. He will personally handle every aspect of your case, and he will always be available to answer your questions. Your phone calls and emails will always be returned within 24 hours. This commitment to personalized care has helped Oceanside wrongful death lawyer Mr. Rubinstein deliver the successful outcomes his clients deserve. He has earned numerous million and multi-million dollar verdicts and settlements for many of his clients, and he will fight tooth and nail to ensure you receive the compensation you deserve. Elements of a Wrongful Death Case. Please contact The Rubinstein Law Group today to schedule your free consultation with an experienced wrongful death lawyer in San Marcos. Mr. Rubinstein serves clients in San Marcos, Carlsbad, Oceanside, Vista, and Escondido, California.